Q: What's the difference between commercial, editorial, stock, and personal project shoots? A commercial shoot is one we do for either an ad agency or client-direct. An editorial shoot is one we do for a magazine. A stock shoot is one we do to create content for our stock website. A personal project shoot is one we do to create images for a personal/self-directed project. Please see below for more detailed breakdowns, including pros and cons of each shoot type. Q: What is a commercial shoot? These are the shoots where we are hired by companies to produce imagery they can use for advertising, marketing or packaging (or all three). The shoots are often highly-produced multi-day shoots involving many animals, people, multiple locations, a producer, production assistants, and a large crew. (Some are smaller one or two day shoots). These are what we call the 'high-stakes' shoots that are usually initiated by advertising/design/branding agencies the end user/company hires. The ad agency is our client, and the pet brand is their client. We are under contract with the agency. Occasionally we will do client-direct shoots and work directly with a company's marketing department (Purina has an in-house creative department for example), but advertising agencies are usually our clients, and they (usually) have a rep from their client (the end user) on set. 1) Your dog gets to be famous! Their photos will be seen either nationally or internationally, sometimes for years to come. You will feel tremendous pride! Out of the millions of dogs in the world, YOUR dog is on the package! 2) You will make a lot more money than the other shoots. (See below). 3) It can be exciting to see your dog working in front of a big crew. Especially if they are highly trained and get to show off their skills. How often do you get entire room full of people fawning over YOUR dog? It will make you beam with pride. 4) More prestige and caché than any other kind of shoot. Trust us when we say it's amazing to be able to say "my dog is on a package of dog food sold around the entire country". Do you know how it feels to walk into a store and see your smiling pooch's photo looking back at you? We do! It's awesome! 1) Can be more stressful and anxiety-inducing for you. There's nothing like having your dog perform in front of a crew of 15-30 people to get your heart racing! 2) We (often) have higher expectations of you and your dog. You will need to show up on time (or early), and your dog will need to perform the behaviors we ask for for that particular shoot. (Don't worry, we allow them to warm up and work their way into the shoot. But for a few minutes, not 10 or 15). Expect to be treated like a high-end model working for fashion designers. We will be kind, but we will also be firm. Don't worry though! We always make it very clear what we are looking for both in the model call and also when confirming you for a shoot. You will always show up knowing exactly what to expect. And Jamie always makes it super fun for the dogs and their owners. Just know that there will be several important corporate clients breathing down the back of her neck while she's shooting. (No pressure, ha!). 3) Like human modeling, dog modeling can be a tough industry, especially for our high-stakes commercial shoots for international clients. As sad as it makes us, we have had clients reject models who show up on set for a variety of reasons. (Too skinny, too fat, too 'weird looking', missing part of his fur, etc, etc). We do every single thing in our power to prevent this from happening (live model calls, requesting multiple images and video from owners, etc), but sometimes it happens. Not often, but sometimes. You can reduce the chances of this by being honest about what your dog can and can't do, what they look like, how much they weigh, how they behave, and providing current/recent photos of them. 4) You (usually) won't get any image files and (usually) won't be able to see any photos until they are 'out in the wild' on products or advertising, which can take weeks, months or even a year or longer. We nearly always license our images exclusively to our clients, which means we don't have the legal right to give image files to anyone else, including the dog model parents. Although occasionally there are exceptions, this is the norm for commercial shoots. Sometimes to sweeten the deal for model parents, we are able to talk our clients into letting us send our dog model parents a print of our favorite photo, but this is the exception to the norm. Bragging rights and cash money are the name of the game here. All of this said, the pros outweigh the cons for commercial shoots. This is the Olympics of dog modeling. Q: What is an editorial shoot? This is quite simply, shoots we do for a magazine article. These are always much smaller, more laid-back and easier for everyone than commercial shoots. 2) Often just one or a few dogs. 3) Usually a super fun time for the dogs. 1) Very low pay, and often in images instead of cash. We always push for at least our minimum 'bottom-line' payment of $50 to models. 2) We may ask for more specific behavior of your dog, depending on what the article is about. 3) Less caché than a commercial shoot, because if it's a local magazine your friends back east/out west probably won't see the magazine or your 'star dog' in it. Q: What is a stock shoot? These are shoots we do every month or two to create fresh content for our stock website. Every month we launch themed stock packs, and those themes have us doing a wide variety of different activities, from hiking, camping and swimming for summer themes, to opening presents, sitting by a Christmas tree, and wearing reindeer antlers for holiday themes. 1) Like the editorial shoots, these are super fun and laid-back. They are mostly off-the-cuff shoots, capturing dogs doing what they do naturally. 2) Your dog won't need to 'perform', and they can just be themselves. Just dogs being dogs! 3) You will also receive the (printable) image files, which will be your payment in lieu of cash. If you would love to get high-quality photos of your dog but can't afford it, this is a great alternative, and one worth anywhere from $850-$1000 depending on the length of the shoot and how many files Jamie delivers to you. 1) Although your payment will be in image files, you will be at the mercy of the shoot concept/theme/ideas photographer Jamie has in mind. She creates the shot list and determines where you go and what you do. (She is always open to input however!). 2) You will be required to agree to allow Jamie to license the image files to any client she chooses. She won't license images to any client depicting animal abuse or neglect, or animal testing, or any other negative behavior, but there is a chance those images could end up on a product you wouldn't purchase for your own dog, and/or associated with a company that you don't personally support or endorse. You have to be ok with this possibility to do a stock shoot. (More often than not, it will be used in ways you will be immensely proud of!). You will never receive further compensation for the stock use of the files, beyond what was given to you at or just after the shoot. There are no royalties in photography like there are in music, commercials and film. Stock shoots are a super fun and easy way to get fantastic images of your dog from one of the best animal photographers in the industry just for being invited and showing up. Q: What is a personal project shoot? These are unique and interesting shoots that Jamie does just for her, to satisfy her own creative impulses and visions. They are inspired by her creative ideas, usually within a specific theme. You can see some past personal projects here, here, and here. Payment for these will almost always be in image files. You get to be involved in something really unique and unusual and possibly cutting-edge. Jamie likes to set her own trends by creating photos that no other pet photographers have before. For example, her Graffiti Dogs Project that she started in 2008, inspired countless other pet photography shoots in front of Graffiti Walls in the years that followed. You will get to watch a visual artist in her true element- turning a vision into a photograph. These are often slower and calmer and more deliberate than any other type of shoot. You will need to agree to a very specific subject matter. 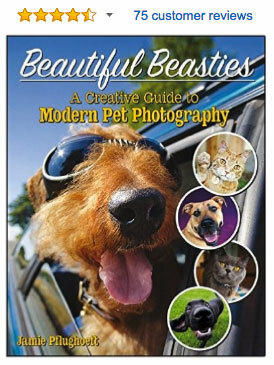 Not interested in having your dog photographed in a train car, or laying in a river, or surrounded by bubbles? You can always pass and be open to the next shoot. For any of our shoots, you always have the right to pass, and it won't affect your ability to get future work. (We won't ding you for it!!). You will need to be very patient with Jamie. It usually takes her longer to think and visualize and shoot than if she is just working off a shot list. There will be a lot of standing around watching her look around at everything, talking to herself and your dog, making hand gestures to no one in particular. It can be very entertaining to watch though. Q: Do I have to pay anything to submit my dog? No. We don't function as an 'agent', so we don't ask for any kind of payment. Q: How often will my dog get a job? It varies a lot, and depends on a variety of different factors, most notably how well-trained and healthy your dog is. We usually shoot once or twice a month, either a multi-day commercial project, or personal project, or for our stock website, or all three. You could shoot a couple of times per year, or just once every two or three years. You are more likely to get work more often if you are open to shooting for one of our personal projects or stock website, as we have pretty loose model criteria for those. Q: How much will my dog be paid? It depends on the shoot, but our standard rate for commercial shoots with ad agencies is $250-$350 for 2-3 hours of work. Sometimes higher for 'pro' models (those who are highly-trained with on-set experience), and sometimes less for 'real-people' dogs. If your dog needs to be on set all day (10 hours), it may be closer to $600-$850, but that's rare. It all depends on what our client approves for model payment. The lower rate is for 'real people' dogs; the higher rate is for highly trained, experienced professional agency models. For the small client-direct commercial shoots, the rate can be as low as $50-$100 for two hours. Sometimes in those cases the client will be ok with us including image files as payment. We always push for the best compensation possible for our models, and always let potential models know ahead of time what the compensation is for each project. Please note that you will never see rates like our human talent receive- from $1,500-$3000 per day (or more), simply because there is a huge supply of great dogs and not enough demand. If you want to get your dog into movies or photos to make regular money, they need to be highly trained (think: Benji), and you should be working with a trainer who is involved in the film industry, you should be living in LA and auditioning regularly for films and commercials. Editorial projects pay a smaller model fee, usually just $100-$150 per 2-3 hour shoot. Personal projects and stock projects always pay in (printable and web-sized) image files. Q: How long does my dog have to work for on the shoot date? We try not to ask our dog models to work more than 2-3 hours. Occasionally we'll need them for 4-5 hours, but it's usually less than that. For the longer shoots, they get plenty of breaks, water and treats in between shooting. Their health, happiness and well-being is more important that anything else. (ANYTHING). Q: What will my dog have to do? It totally depends on the shoot. For commercial shoots, at minimum we will ask a dog to sit, stay for 4-5 seconds minimum, and lay down, usually in a very specific place, for example a bed in a bedroom in a residential location, or in front of the back door, or on the patio, or on an apple box in a studio, etc. We may need them to lay in the lap of the human talent they have never met before. Sometimes we will need them to run between marks. (We nearly always have dog trainers on set for commercial shoots). Sometimes we need a dog who will hold something in their mouth, stand with paws on a counter, look over their shoulder, or look up at the human talent while jogging, or other specific behavior, but we always cast models with this in mind. Q: Is my transportation paid? It depends on the location. We usually roll the travel fee into the model fee, but if we are shooting in the middle of the woods an hour outside of Los Angeles, and all of our talent will need to drive a long way to get there, we will ask for additional talent travel compensation from our clients. Q: Is my travel paid if I decide to come from out of state/out of region? No. We always cast dog models that are local to the shoot location, or minimally, within the same region. The supply of great dogs far outweighs the demand, so it's easy for us to get exactly what we need in Southern California. If, however, you want to drive from San Diego to LA (or vice-versa) for a shoot, and make a day trip out of it, we are totally fine with that, provided you can arrive on time. We recommend planning to arrive an hour early, that way you have breathing room for (unavoidable) traffic. Your dog's favorite toys, treats, a variety of collars and leashes (if you have them), collapsible water bowl, poop bags, water, and an old hand towel or bath towel. Please make sure you bring your dog's special treats if they are on any kind of a diet, and/or have health restrictions that limit the kinds of food they can eat (liver disease or IBD for example). A photo shoot isn't worth making a dog sick over. Q: How can I improve my chances of my dog getting a job? #1: Train them! The more obedience commands and tricks they will perform consistently and reliably, the more likely they are to be selected by our clients. #2: Keep them healthy. A healthy dog is one that looks great in photos, and our clients want to work with them. Q: Will my dog have to work with other dogs? For commercial shoots- yes. There will nearly always be other dogs nearby, so we can't have dog aggression on set. If your dog shows up on set with aggression toward other dogs, they will be sent home immediately. The safety of our talent is our *number one* priority. For editorial shoots- depends on the shoot. Sometimes yes, sometimes no. For stock shoots- again it depends on the shoot. It may be possible to set up a shoot just for one dog, but they have to have something awesome to provide. (Great looks, personality, tricks, etc). For personal projects- it's usually just one dog at a time. Q: Will my dog have to work with people? Usually, yes, in most cases except for some personal projects. Your dog must be people-friendly or Jamie won't work with them. She is happy to work with dog-aggressive dogs in some cases, but dogs that are aggressive with humans is where she draws the line. Q: Will I get to have the image files? Editorial shoots- sometimes. (Depends on the client's restrictions). Q: How do I know my dog will be treated well? This Facebook post written by photographer Jamie, and the comments from some of her dog model owners, should give you all the piece of mind you need. Like she has always said, she is a dog lover first, a photographer second. You can trust that the entire Cowbelly team loves animals, and we have strict rules about the treatment of animals on our sets. Their happiness and well-being is our utmost concern. Email us at info@cowbelly.com, and we'll be happy to answer them.